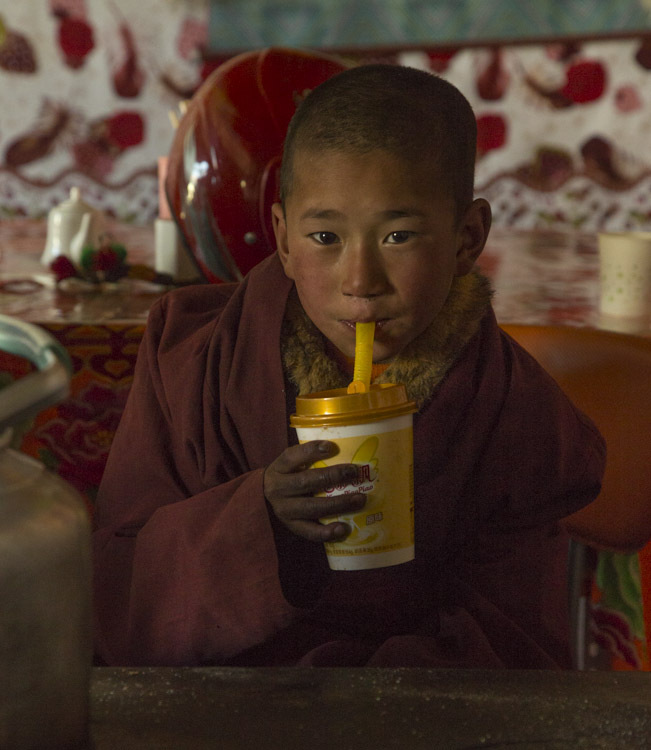 When a pizza is delivered in Bhutan’s tiny capital, Thimphu, it comes with a side of eazay – a traditional Bhutanese hot sauce. While momos (dumplings) are the traditional thing to dunk into eazay, it tastes just fine with a slice of Margherita. 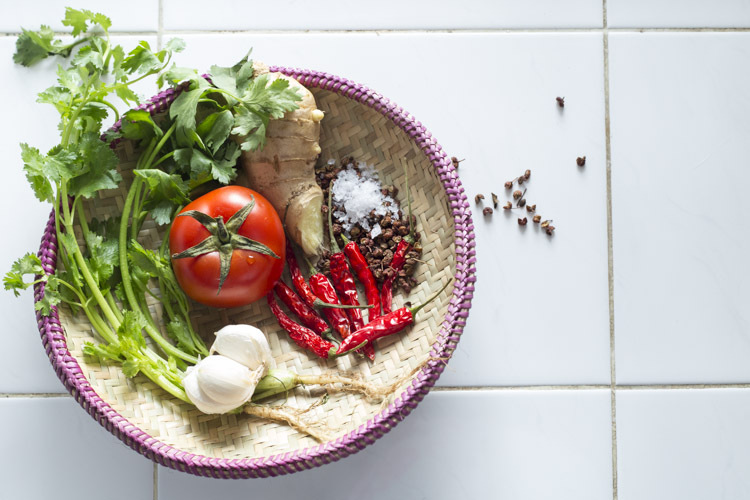 Both eazay and sepen are freestyle condiments, adapted by each cook to their taste and whatever ingredients come to hand. The only constants seem to be red chilies (lots of red chilies) and salt. 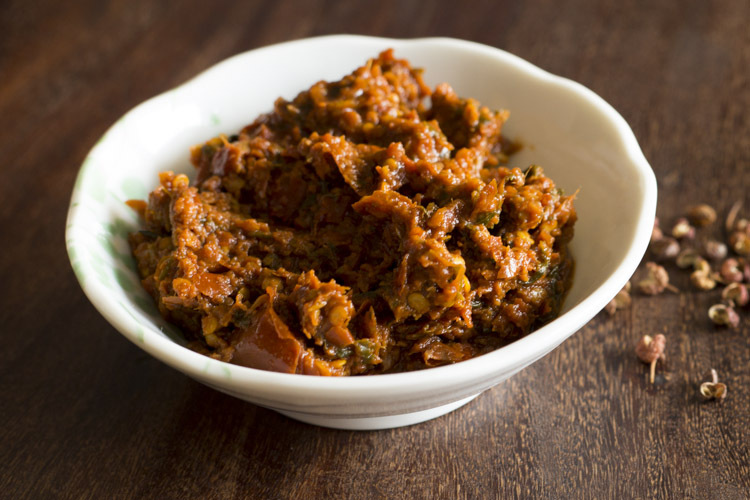 The sauce can be served raw or cooked, kept tongue-searingly hot or mellowed with the addition of cheese and vegetables, roughly ground by hand or whipped smooth in a blender. 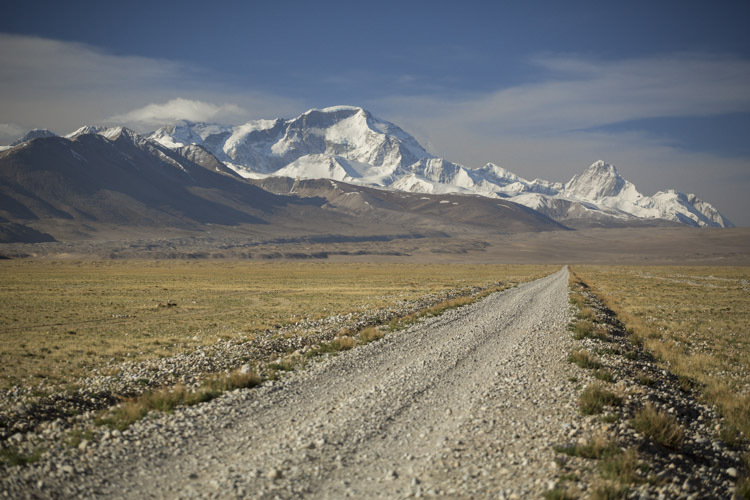 While the chilies themselves are a non-native plant that’s been enthusiastically adopted, Sichuan pepper grows wild in the hills on either side of the Himalayas (it’s known as “wild pepper” in Bhutan). I like its fragrance and the way it leaves your lips tingling, but it’s not to everyone’s taste – if you’re not a fan, replace with black pepper or simply omit. A recipe for cheese and potato momos is in the works for next week, but until then, maybe give Domino’s a call? 1. Soak the chili peppers in cold water overnight. Drain, rinse and remove any stalks that are still hanging in there, then chop roughly. 2. 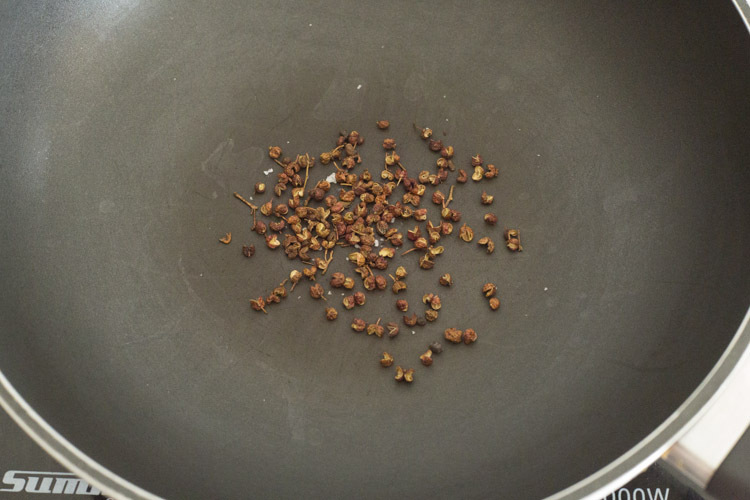 Roast the Sichuan pepper in a dry pan. Remove from the heat when the peppercorns start to release their fragrance, and grind to a powder along with the salt. 3. Roughly chop all the other ingredients. 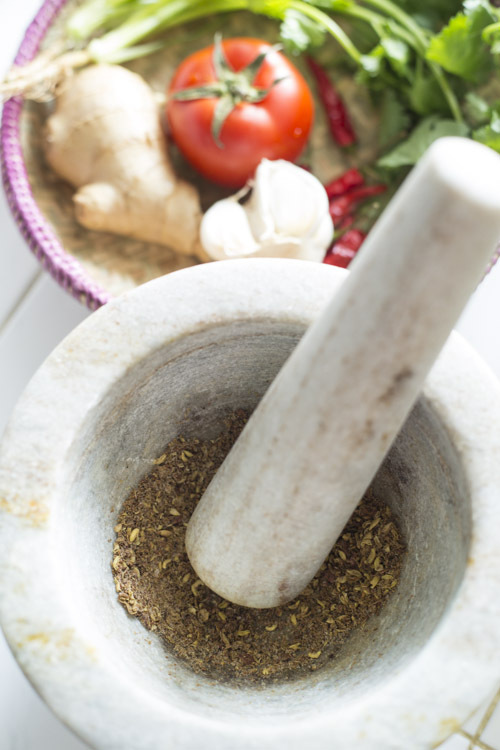 You can either put everything in a blender and blend until smooth or mash about in a pestle and mortar until you’re happy with the texture. 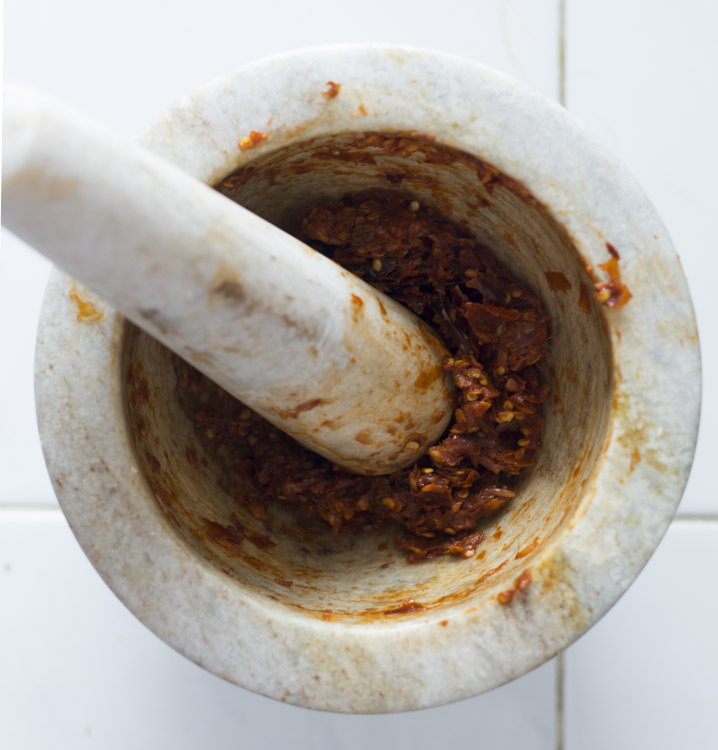 I used a pestle and mortar and expected my arm muscles to regret that decision, but the sauce was actually pretty easy to grind, although I needed to fish out some recalcitrant pieces of tomato skin at the end. 4. (Optional): tip the paste into a pan and cook it for a few minutes, until some of the water has evaporated and you’re left with a thick paste. 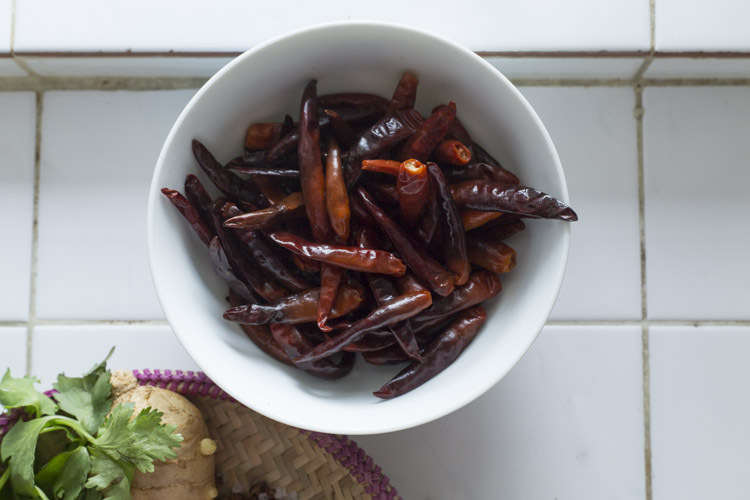 I’m often a bit flummoxed when I read recipes from the Americas – the range of chilies available is amazing… Where I live, chili peppers come in two varieties, big and small. The small ones are what’s needed here – I believe they’re also known as bird’s-eye chilies. Beware of chili fingers! I suffered from a terribly painful case of chili fingers earlier this year after making green curry paste, a lesson that I have completely failed to learn from. I’m not a fan of disposable gloves, so the following will be my preferred way of preventing chili fingers, if I ever remember to do it before I start chopping – rub cooking oil over your hands before you cut the peppers up, then scrub them with half a lemon or lime when you’re done.